The past few years have seen over-the-top (OTT) video platforms come to dominate content delivery and consumption. We’ve developed interactive TV and OTT experiences for some of the world’s leading media companies, including Time Warner, Fox, CBS, and CBC. We consider differences in context, input, and ergonomics that are essential to creating incredible TV experiences. Our proprietary Salix™ video platform allows us to rapidly deploy OTT projects in weeks, not months. 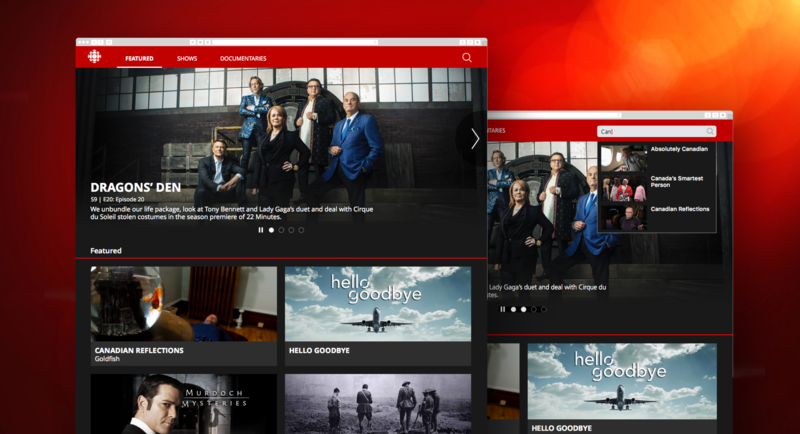 The Canadian Broadcast Company approached WillowTree to craft a seamless OTT programming experience, across any and all platforms and devices on which users might engage their content. They also needed a product that would rest on top of IBM’s video cloud delivery platform and support OTT accessibility features such as descriptive video, voice over/talk back, and web screen readers. The final product of our work for CBC combined all of these vital under-the-hood capabilities with a user experience focused on speed, simplicity, and elegance. The CBC app delivers more than 1 million streams every month and has been featured in the App Store. Read more in our full CBC case study. We conceived of Salix as a tool to get a stable, full-featured OTT product to market fast. Salix helps video-on-demand providers customize the look & feel of their platform all while seamlessly integrating a vetted, world class user experience. Salix has already become a vital tool for leaders in the OTT content space, and additional planned features for this platform ensure that video on-demand providers can continue to deliver on the ever evolving needs of subscribers. Learn more about Salix here.